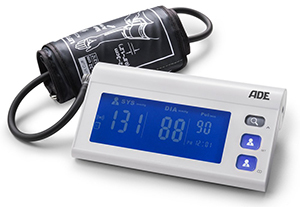 The ADE BPM 1401 is the latest in ADE’s high-tech health monitoring devices. As well as allowing you to store up to 60 readings in the unit, you can link it instantly to your phone to track and analyse your data in the free adeVital app. If there are two people in your household who need to monitor their blood pressure, then both can use this device and link it to separate accounts. Keeping track of your health has never been so easy! You can look back at past readings at any time on the unit’s LCD screen by pressing ‘search’. This shows you an average of your last three measurements, then allows you to scroll through your last 60 readings by date and time. For more detailed stats, you can use the units Bluetooth technology to link to the adeVital app on your phone or tablet. Using the free adeVital app, you can instantly transfer data from the monitor to your phone or tablet using Bluetooth 4.0 technology. When you use it with the BMP 1401 you can link two separate accounts so that both of you can use the app. In adeVital you can view all of your measurements in graphs, tables and charts that make it really simple to get a clear picture of your overall health. It will display individual readings with their date, systolic and diastolic values and pulse rate and frequency. You can then choose to see these as line charts, customised for any date range you need. This makes sharing your progress with doctors and other health professionals so much easier; you can even send them the data via email, twitter or facebook! If you are using an iOS device, adeVital can be paired with Apple Health to link to your other health data.